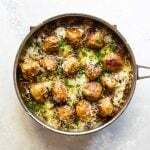 These skillet French onion chicken meatballs are a twist on French onion soup and make for a cozy cold-weather dinner. Caramelized onions are simmered in a rich sauce with chicken meatballs seasoned with herbes de Provence. Serve the meatballs with pasta, rice, or bread on the side or pile them into rolls for decadent meatballs subs. Melt the butter in a 10-inch skillet over medium heat. Add the sliced onions (the pan will be very full). Cook the onions, stirring them occasionally, for about an hour or until they have turned a light golden-blonde colored. At this point, turn the heat to medium-low and keep cooking them, stirring occasionally, until they are soft and a deep golden brown in color, approximately 30 to 40 minutes longer. Turn the heat back to medium and pour the wine into the pan with the onions. As it simmers, scrape up any browned bits off the bottom of the pan. Once the wine has cooked away transfer the onions to a clean plate. In a large bowl, combine the breadcrumbs, herbs, salt, pepper, and egg. Add the ground chicken and, using a wooden spoon or your hands, mix it with the breadcrumb and egg mixture just until combined. Scoop approximately one ounce of the mixture to form the meatballs. You should be able to make 16 meatballs. Once the onions are ready and you’ve removed them from the pan, add the olive oil to that same pan. Heat it over medium heat. Place the meatballs in a single layer and cook them until they are browned on all sides. Transfer them to a clean plate. In the same skillet, melt the butter over medium heat. Add the flour and whisk it with the butter until combined. Add about a 1/2 cup of the chicken stock and, whisking continuously, combine it with the butter and flour. As you whisk you should be scraping up any browned bits off the bottom of the pan. Whisking continuously, add the rest of the chicken stock. Bring the pan to a boil and cook the sauce for about five minutes, or until it starts to thicken. Add the caramelized onions and stir to combine. Lower the heat to maintain a simmer. Add the meatballs to the sauce and continue cooking the sauce until it’s glossy and thickened about five to ten minutes. At this point, you can sprinkle the cheese over the meatballs and either cover the pan to melt the cheese or stick the pan under the broiler for a couple of minutes. Garnish the meatballs with parsley, if using.